Want to say hi to Eli yourself? Connect with the 'Come Say Hi to Eli' movement on Facebook, Instagram and Twitter. In many ways, Eli Meyer is a typical first grader. He loves Play Dough, Legos, coloring and playing with his three older siblings. But it's what makes Eli different that most people see first. "When people look at me I think they say, what happened to me," Eli said. 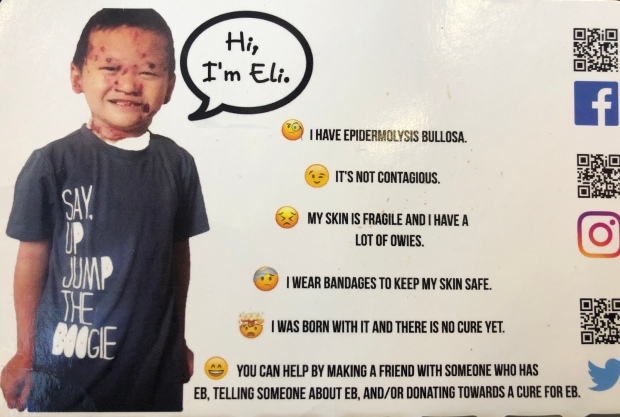 Eli has Epidermolysis Bullosa or “EB.” It’s a genetic disorder, with no cure yet, that makes his skin extremely fragile. 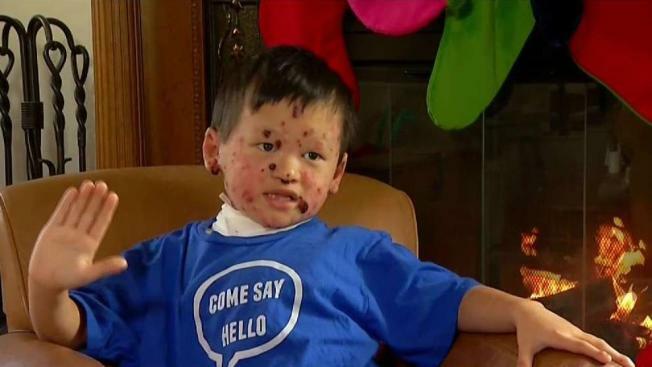 Although his mother, Michelle, spends hours a day caring for his highly sensitive skin, he is covered in blisters and sores in various stages of healing. Michelle said the genetic condition means Eli lacks a specific protein that makes skin strong. She said any bump or friction can cause a blister or the skin to shear off. In public, the scabs, scaring and bandages that come with the disease often trigger questions, comments and hurtful stares. "'What's wrong with him?' I get that a lot,” Michelle said. “'Is he OK? Does he have chicken pox? Did he draw on his face with a marker?' I've had that a few times,” she said. Eli’s 8-year-old sister Lily said "Sometimes at the park, the kids just stop and then point and stare." Michelle said sometimes the reactions are enough to make them not want to leave the house. Those uncomfortable situations prompted Eli's sister Lily to make a social media public service announcement encouraging people to greet little Eli instead of ostracising him. In it, Eli and Lily role-play a meeting. “This is what you do when you see someone who looks different than you," Lily says to the camera. 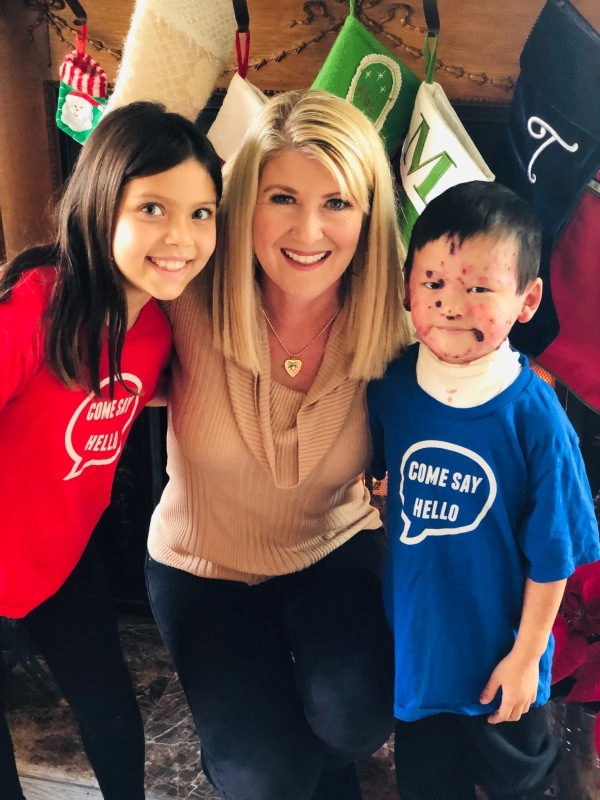 The Meyer family is hoping others will take this message to heart and realize that when you say hello, it opens a door to understanding others’ differences. “I think it's great,” Michelle said. “I think it is great coming from a child because it's so easy for them, even more so than adults, to just say ‘hi’ and play with a kid who looks different," she said. Eli was adopted from China. The Meyers were aware Eli had EB prior to his adoption. Michelle said the bathing and bandaging process takes at least two hours every day and can be painful. Eli also makes frequent trips to the hospital. Michelle said learning how to care for a child with EB has been harder than she ever imagined. But she said she and her family are strengthened by their Christian faith and the support they’ve found in family, friends, medical professionals and the EB community. The family carries special cards they made to help strangers understand EB. Eli said it helps people get to know him. "Some people don't know who I am and they don't know why I have these things on my face and my body,” he said. When you look past his fragile exterior you get a glimpse of the sweet spirit of this thoughtful young boy who brought my photographer and I drinks during the interview and even drew me a picture. Lily called Eli a great brother who loves to laugh. "Whenever he laughs everyone starts laughing because his laugh is just, like, so cute and funny,” she said. Lily hopes others will take the three-word phrase “Come say hi” to heart. "I hope when people see people who are different than them they just stop and not stare and say hi,” she said.